The following article was originally written for the online site Surf Crazy in an effort to define and defend what Valley Cowboys were in the surfing world of the 1960s. It is being reprinted here for the general public. In the 1960s there were indeed many of us from the San Fernando Valley in the water at any given time. We embraced the sport as boldly as those who lived on the beach. Yes, we were envious of our beach friends even to the point where many of us later moved to the beach. I lived for a short while in El Portal near Manhattan, California and later in Santa Barbara just to be closer to the ocean. Most of us fit in quite well because we were great surfers and good sportsmen. There were definitely rivalries between coastal and valley surf clubs but nothing nasty that I can remember. Any grudges were settled in the water through regular contests and in the end we were all good friends. Pride, local and club affiliations were abundant but minus the unsportsmanlike conduct that grabs the news today. Back then surfing was considered a “clean” sport and I was proud to be a part of it, even though I lived in the town of San Fernando. I believe Dora referred to all of us collectively as “Valley Kooks” and I’m sure that he was instrumental in the whole pejorative valley thing. Although I was never called a “Valley Cowboy” or anything of the sort, I do remember “Valley Go Home” as part of the graffiti that decorated the wall at Malibu. However, Dora’s name was there too along with others, some of whom were from the SFV. Most of us who lived as young teenagers in the San Fernando Valley regularly surfed more breaks than the beach dwellers. If you lived in Santa Barbara, you tended to surf breaks from Rincon northwards. Likewise, if you lived in Hermosa Beach, you tended to stay in the South Bay. Because we weren’t really near any breaks, we could head to the South Bay, north to Ventura or straight over Malibu Canyon to Malibu. Even Mexico wasn’t out of the question and we were regularly at K38 1/2. Nothing was out of reach and with gas being less than 25 cents a gallon, the whole coast was ours if we could just beat the quarters out of our friends we transported. I often took five other guys with me in my 1956 Chevy Wagon. At 50 cents a head, I was set and could captain that old boat anywhere! The brand name of my first board (1962) was probably P.O.S. It was a terrible blank that was put together with terrible fiberglass by a friend with no skill. (You know who you are.) After it was broken in half by storm surf at Santa Monica a year later, I graduated to a 9’6” Jacobs for which I paid $120. That was a hell of a lot of scratch for those days so I took really good care of my baby. I surfed that Jacobs forever and in every competition that I entered. Eventually I picked up a couple of minor nose dings so I learned the art of fiber glassing from my father and opened-up a small repair shop. I parlayed the money I made from others’ misfortune along with a few blanks into what I thought would be a lasting name, Rizzi Surfboards. I think I made maybe a total of three boards, all 9’ 6” copies of my Jacobs. The only difference was that I reduced the square tail a bit and “un-chunked” the rails. I haven’t seen one since 1967. While I remember Val Surf in North Hollywood, I was never really a Hobie fan so my visits were infrequent. I also remember the West Coast Surf Shop on Saticoy. However, like so many of us “Valley” surfers, I preferred surf shops that were where they should be; at the beach. It gave me an opportunity to meet the guys from the beach and learn from them. I soon found that the guys who lived at the beach and the guys who lived in the valley were all pretty much the same. The guys at Hope Ranch Surf Club and the Malibu Surfing Association, while having a bit of anti-valley prejudice at first, warmed up if you knew your way up and down a wall and weren’t a “wave hog.” In the end I had a lot of good friends in Malibu, Carpinteria, Manhattan Beach and Santa Barbara. I remember vividly the reference to the “thumbs up, thumbs down” hand signaling that went on during road trips through Malibu Canyon. Also, if there was a really good swell going on, the traffic on that road would literally be bumper to bumper. 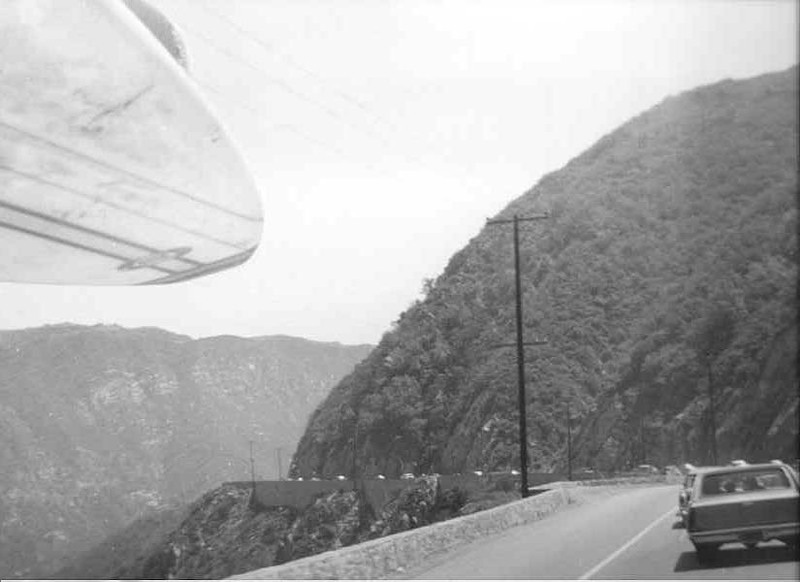 This photo was snapped on our way to Malibu in 1965. One trait that most of us “valley surfers” shared was to hit the road early or even the night before in order to be the first ones in the water. What we lacked geographically, we tried to make up by being crafty. I personally remember hearing a rumor about an 8 foot break at Malibu, driving to the beach at 1 a.m. and waiting for the first light so that I could be the “first one in.” (I was.) We eventually took this a step further and night surfed at Malibu when for sure there would be no one else around. It was a great technical training exercise, as you had to rely on sound more than sight. However, we soon learned that a moonless night could be catastrophic. For a broader picture of surfing in the 1960s, read Fifty Years Ago: A Surfing Trilogy.